This is a really nice site which provides free high quality pictures of Bible Lands taken by Dr Carl Rasmussen. Those of you who are familiar with the Zondervan NIV Bible Atlas know that Dr Rasmussen was the author of that volume. The site allows you to browse in three ways: a) Daily Life and Artifacts, b) People and c) By Region. What is nice is some of these images are ready sized available for use in Powerpoint teaching. Here's a research question: In the Bible, there are passages which describe the Tabernacle. Where are these passages to be found and how would you describe the tabernacle? OK, here's the answer. To the question, "Where are these passages to be found? ", go to www.biblegateway.com Clue: Check "Exodus". To the second question, visit www.holylandphotos.org. Go on the top right corner and click on Daily Life and Artifacts>Religion>Tabernacle. 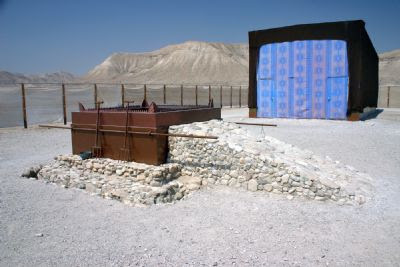 Here's one of the sacrificial altar outside the Tabernacle but within the curtained area of the Tabernacle structure.